The Coen Brothers' new film, Inside Llewyn Davis, is about the New York folk scene of the early '60s, and its impending release will be celebrated with the Showtime concert special Another Day/Another Time on December 13. 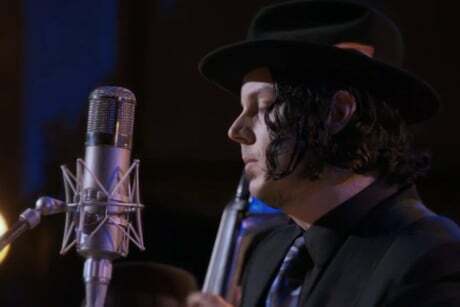 The show features a folksy performance from Jack White, and footage of him playing the White Stripes' song "We're Going to Be Friends" has emerged ahead of time. Dapperly dressed in a black suit and fedora, White and an accompanying acoustic ensemble give the song a folksy makeover featuring backwoods harmonies, fiddle, banjo, and a silver metallic upright bass. The show was filmed at New York's Town Hall, and performers include the Avett Brothers, Joan Baez, Colin Meloy (of the Decemberists), Marcus Mumford (of Mumford & Sons), Patti Smith, Gillian Welch and more.